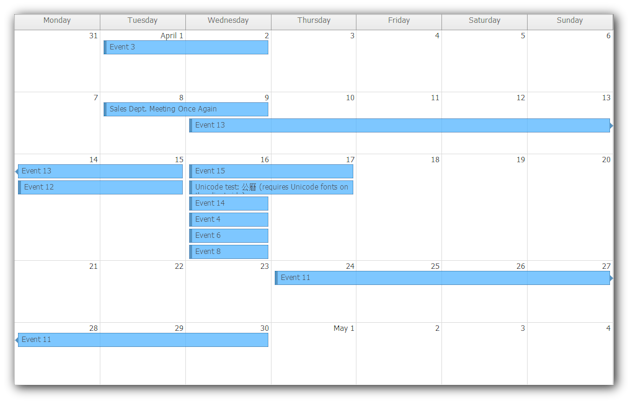 A new version of the AJAX calendar/scheduling widgets package for Java. A new version of the AJAX calendar/scheduling controls package for Java was released. Modal/delayed click for touch devices. [Scheduler] Using cell background colors defined in BeforeCellRender in optimized cell rendering mode. [Calendar] onBeforeCellRender: e.setBackgroundColor() and other properties work. [Scheduler] onBeforeCellRender: e.setBackgroundColor() and other properties work. [Scheduler] getCssOnly() available on the server side. [Scheduler] cssOnly/default background cell color. [Demo] Minor bugs fixed. Updated to CssOnly. [Calendar] Default background cell color for CssOnly mode. [Calendar] Background cells demo added (BackgroundCells.jsp).